CPAC Dry Heat Sterilizer. 2 & 3 draw are available. CPAC Dry Heat Sterilizes bring high quality, rugged performance, and total dependability to your practice. CPAC Dry Heat Sterilizers require no routine cleaning. 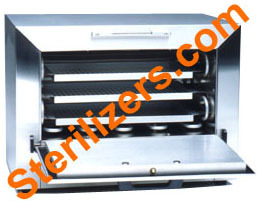 Utility trays can be sterilized with lids on and stored without contamination. CPAC Sterilizers also have automatic timers with heat "hold" capability for continuous use in a busy practice. Operates on 115V AC electrical power. Inquire about other voltage. Use Dry Heat Sterilizing Bags as part of your infection control procedure for an added measure of safety. The azure strip turns brown when it has been exposed to high temperature. 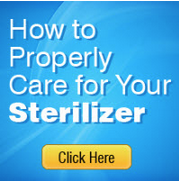 The paper used is specifically formulated for dry heat sterilizers.